When did Ram, the avatar of Vishnu in Hinduism, exist on earth? 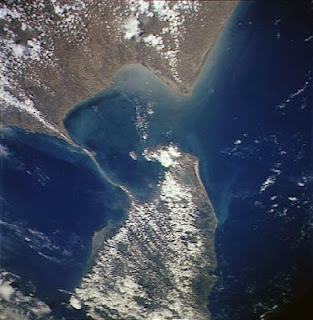 NASA satellites found a bridge made of rocks and stones under the sea linking India and Sri Lanka. Upon scientific investigation they concluded that this was a man made bridge dating back some 1.5 - 2 million years ago. Not knowing which men existed at that time they decided to name this the Adam's bridge. This bridge in Hindi is called "Ram Setu" or Ram's bridge. This bridge is mentioned in the Hindu epic, Ramayana, which depicts the story of King Ram, the avatar. His alliance with the ape like army in south India, amongst other animals, helped him in building a bridge between India and Lanka. Ram is mentioned in the epic to have been an avatar in the Treta Yug (eon). The Hindu cosmic calendar has many divisions of time, including a grand eon (Maha Yug) which is divided into 4 eons, Sat Yuga, Treta Yuga, Dwapar Yuga, and Kali Yuga. 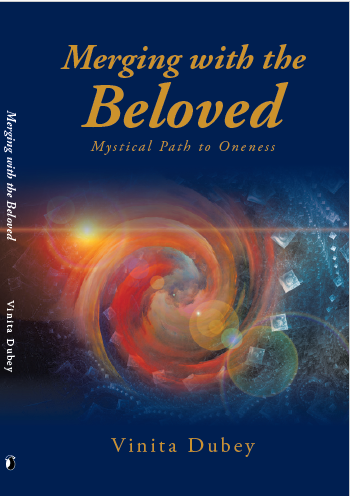 We are approximately 5000 years into the Kali Yuga which lasts for 432,000 yrs. Dwapar Yuga is twice that, 864,000 years, which ended with the departure of another avatar of Vishnu, Krishna. There were 1,296,000 years in TretaYug, and 1,728,000 years in SatYug. So according to the calculation of Yuga, Ram existed between 869,000 and 1,301,000 years ago, which is the range of the Treta Yuga. 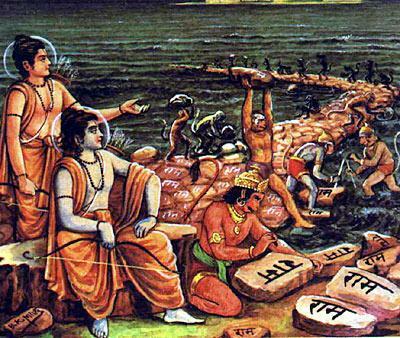 Ram was the first "human" avatar of Vishnu. Vishnu is also known as Narayana. Narayana is synonymous with the nervous system and the avatars depict the evolution of the nervous system. The avatars of Narayana follow the same evolution as the evolution in science (by Darwin). First is the fish avatar, Matsya, then the amphibian avatar, Kurma. Then the mammal, Varaha, the boar. After this was half animal half human, the Narsimha avatar. Then came the dwarf, Vaman, same as how the human species started as dwarfs. Next was the caveman, Parashuram. The first erect human with long hands was Ram. The various descendent species of the Homo-erectus also existed between 1.5 - 2 million years ago. If you look at the migration map they came out of Africa, through Mesopotamia, and Persia into northern India. The descendent of the older species, Neandrathals still existed also around this same time, who came from Africa to southern India. This explains the ape like inhabitants that Ram found when he traveled south, of whom the famous one is Hanuman. 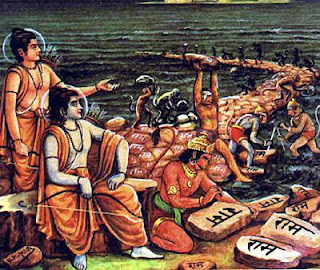 There are other very interesting facts in the epic Ramayana that point to this pre-iron age. Most of the things in this epic are made of wood. There is no farming or the plow mentioned in the Ramayana which also points to this age. All these facts interestingly point to the age of Ram around 1.5 million years ago.